NetEnt latest blockbuster slot Hotline has landed at Casumo and the popular UK casino celebrates by handing out no deposit bonus spins to all active players - with the added chance of taking down a huge cash prize. Check out the high speed slot for yourself with an extra deposit bonus this weekend! 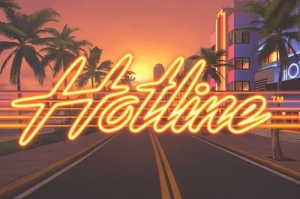 Put on your seat belt, you’re in for a high speed race through the streets of Miami in NetEnt’s latest slot called Hotline. The valuable wild reels can land and stick to the reels at any time, especially if you activate all the three bonus reels. Hunt the scatters to get to the bonus game where speed picks up even more and enjoy the awesome tune in the background. Between Friday and Saturday, Casumo will add 3 bonus spins on Hotline to every active player. In addition to getting to try out the game for yourself, you have the chance to win up to £3,000 in pure cash if you’re extra ucky with your spins. The top three players who wins the most with their no deposit spins will share a prize pool of £4,500 that is added straight to their player accounts! Just login, play your spins and cross your fingers. The bonus spins have a wagering requirement of x30, you can read the full bonus terms and conditions at Casumo. If you enjoyed your spins on Hotline and want even more, you have the perfect chance to get some extra action on it this weekend. Casumo has prepared a deposit bonus for all active players this weekend, so login and check your inventory to see if the deposit bonus chip is waiting for you. If it’s there, you just need to activate it to get a 50% bonus up to £100 on your next deposit! The offer is available during Friday and Saturday and your deposit + the bonus must be wagered 30 times before you can make a withdrawal. Take it to the streets and see if you can land a full screen of wilds in one of the coolest slot releases so far this year! And make sure to not miss out on the special £2,000 Reel Races on the same game this weekend. Visit Casumo and read the bonus terms and conditions before claiming the bonus offer.